Lady palm has a layered, almost Oriental look - different from most other South Florida palms. 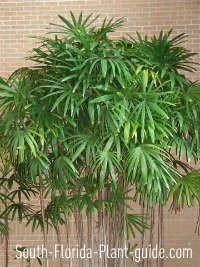 A graceful palm for garden areas that allow it room to spread out, this palm grows multiple thin trunks topped with fronds like little green umbrellas. The fronds above are slightly offset from lower ones, so many are visible at the same time to create a lush, layered look. Even though lady palms are clustering, they grow so slowly they're easily controlled and won't get away from you. Their rounded shape gives an appealing formal yet tropical appearance. You can clean up the base if you like the tall, Oriental umbrella look, or leave the palm full to the ground. The lady grows slowly to an ultimate height of about 8 to 10 feet. Sun or shade is fine, though in a shady spot, the fronds keep their best deep green color. 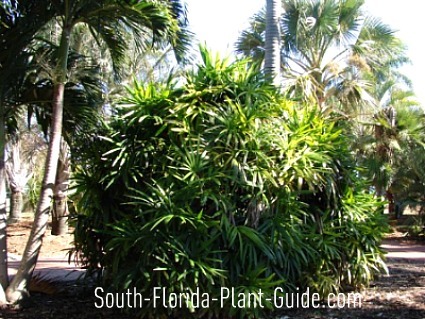 Lady palms are moderately cold tolerant - best when grown in Zone 10 or in Zone 9B in a protected area. If your palm suffers any winter damage on existing trunks, new ones will usually appear to replace them (although it takes a while). These palms are moderately salt-tolerant as well. When you buy one of these palms, ask at the plant nursery in which light - sun or shade - the palm was grown. Most are grown in partial to full shade, so if you take it home and plant it in full sun, it may suffer leaf burn and possibly heat wilt as it adapts. Better to buy one grown in the same light where you'll be planting it. For ways to help a sun-or-shade plant adjust to a new light condition, see the page on Plant Light Requirements in the Gardening How-To section. Plant with organic peat moss or top soil added to the hole. Water regularly...this palm can suffer damage from going too dry over long periods, though it doesn't like "wet feet." Fertilize during the warmer months of spring, summer and fall, at least once per season. In a sunnier location, you'll need to fertilize and water more frequently to keep the palm fronds a healthy green and the plant full. Trimming is usually only necessary occasionally, most often to clean up any cold damage. In this case, you can cut off browned fronds, and remove dead trunks at ground level...new ones forming will grow up to fill in any gaps left. If you're planting several, they can go as close together as you like. And this is one palm that can go right up against a house, fence or tree, since it will spread outward from wherever it's planted. When you're placing in a garden area, you can closely surround a lady palm tree with small plants that can be removed later (perennials are a good choice for this) as the palm fills out. As long as you provide regular watering, containers or planter boxes are perfect homes for these palms since they grow so slowly. 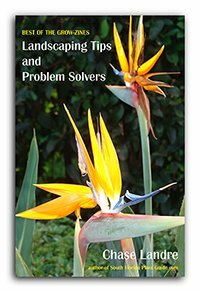 COMPANION PLANT SUGGESTIONS: Plants that do well in partial sun or shade will be good companions, such as orange bird of paradise, variegated arboricola, star jasmine, heliconia, cordylines, Aztec grass, and pentas.